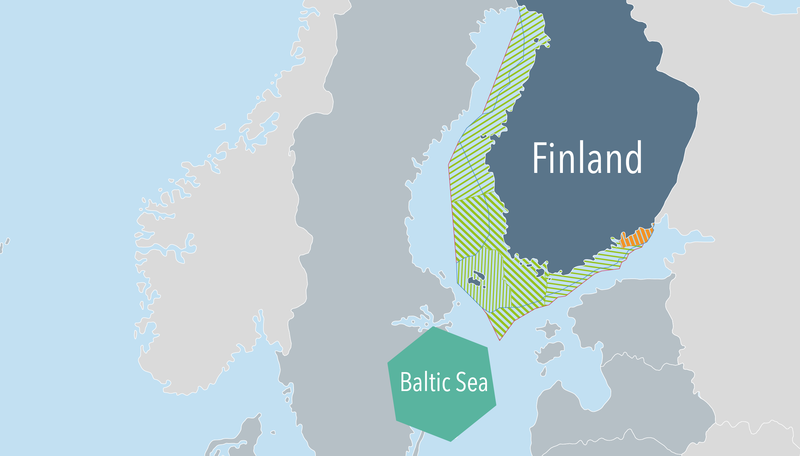 Compared to other Baltic Sea Region countries, the intensity of sea space use in Finland is low - in the northern part - and moderate - in the southern part. Shipping is very active between Helsinki and Tallinn as well as to the Russian harbours along the Gulf of Finland. the Gulf of Finland drafted by the Regional Councils of Uusimaa and Kymenlaakso. Additionally, there will be an MSP Plan for Aland Island to be developed according to separate planning legislation. Stocktaking, data and other planning materials will be finalized during the spring 2019, and a public consultation of the planning scenarios is currently open. The planning phase will be carried out by the beginning of 2020, and thereafter plans are expected to be approved by regional councils. There already exists one specific regional land use plan which includes the territorial sea: the Regional land use plan for the Kymenlaakso Region territorial sea area. The maritime spatial planning directive was transposed into Finnish law in 2016. MSP regulations are given as a part of the Land Use and Building Act, which is the most important act to steer land use, spatial planning and construction. Nonetheless, maritime spatial planning is not part of the land use planning system in Finland. Maritime spatial plans are general, non-binding plans that are drafted and approved by the Regional Councils. A national maritime spatial planning coordination group has been established for developing maritime spatial plans and also for developing the planning process.